Looking for help around the house? 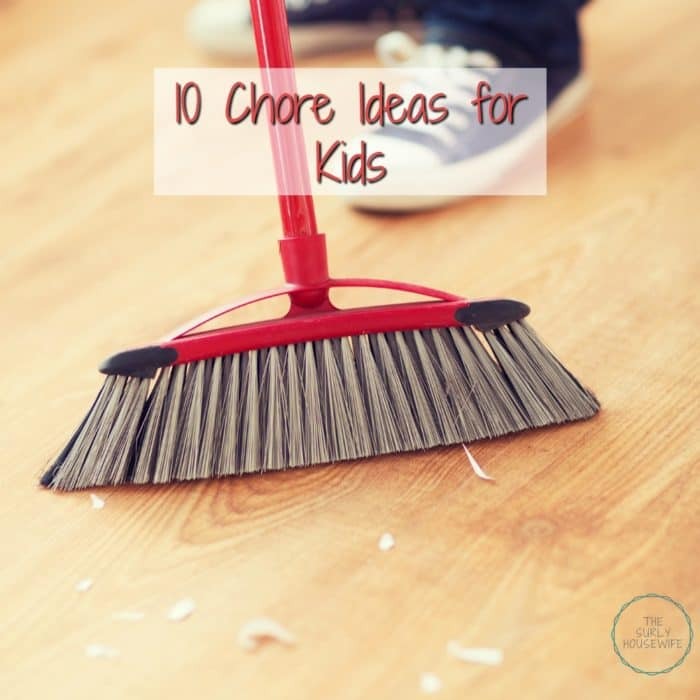 Here are 10 chore ideas for kids. This post may contain some affiliate links for your convenience (which means if you make a purchase after clicking a link I will earn a small commission to help keep my blog up and running, but it won't cost you a penny more). For more information, please read my disclosure policy. Having kids comes with many perks. One being, free labor. Naturally once they are old enough to start helping, like really helping, they don’t want to. The secret is to start them young. Little kids LOVE to help. It makes them feel grown-up. Boosts their sense of self-worth. Makes them feel part of the family and part of a team. 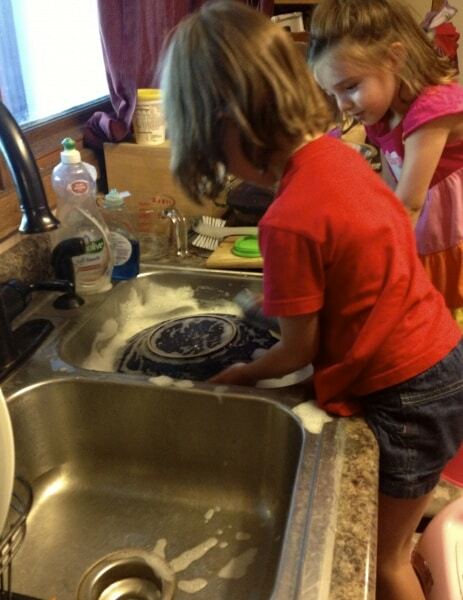 I have always included my kids in my household cleaning routine. 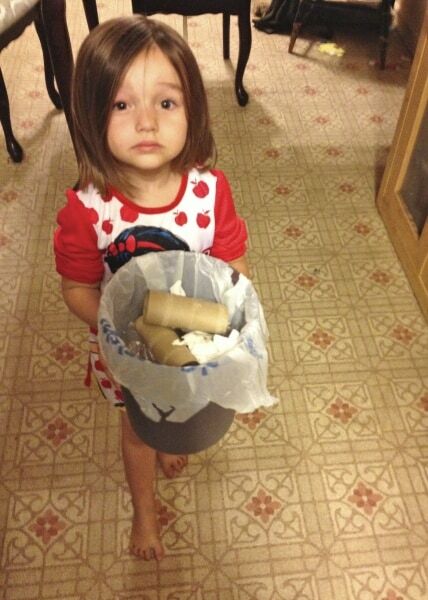 I have a list of 10 chores ideas for kids, any kid!, so they can begin to help around the house. 1. Clean/Wash the car. I think most car washes can’t beat a good old-fashioned hand cleaning. 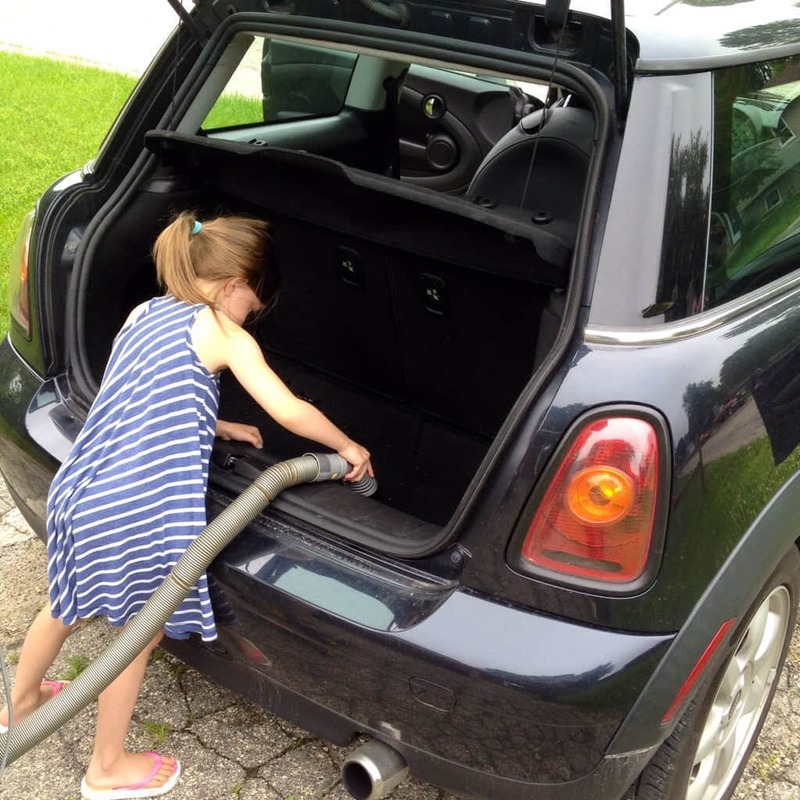 Granted I don’t actually have to do it, but the girls love to go and help Papa wash the car. 2. Weed the garden. This can be tricky before a lot of plants have grown, you don’t want them weeding your actual plants. But they can help pull the big weeds before you till up the garden, pick up rocks, and empty buckets. I usually have the girls act as runners between the garden and the compost as I am weeding. If you love gardening, I recommend getting them their own set of tools, like these!, so they can feel really proud of the work they are doing. 3. Feed and water the pets. 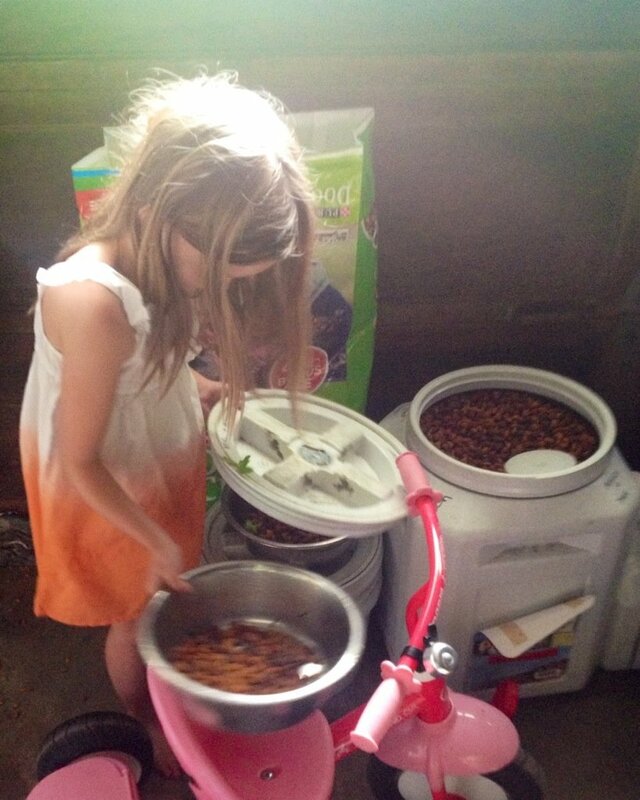 Our water dish is too big for the girls to fill up, but Harley does an awesome job of feeding the animals! 4. Set the table. 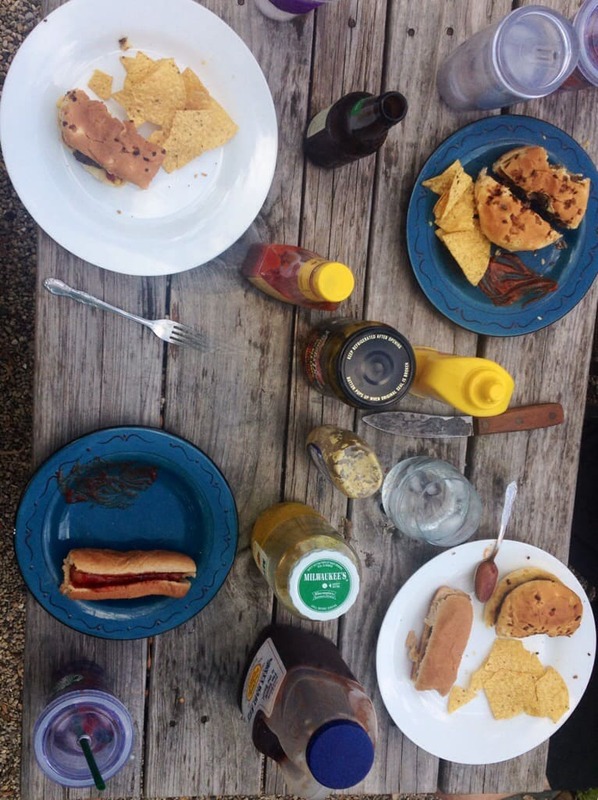 Whether you are having dinner inside, or a cookout by the fire, kids can help set up the dishes and all the condiments for the dinner table. 5. Laundry. The girls help out from everything to loading the washer, transferring to the dryer, putting the clothes away, and striping the sheets for their weekly washing. And they help me make my DIY laundry detergent! 6. Vacuum. I will admit I don’t let them do this often because it requires a huge amount of patience and I have zero. But when they do, they wear crowns. Because who wouldn’t?! 7. Empty the dishwasher. We work together emptying the dishwasher. The girls put away the lower items and hand me the dishes that go up in the cupboard. It’s a great exercise in teamwork. 8. Dinner prep. My husband is a saint with this. Me, not so much. But letting the kids help with dinner is a great way to spend time together as a family and may help them eat more of their supper! 10. Empty the trash. I’m not sure why Bear looks so terrified here, but kids are a great asset in getting all those small garbage cans rounded up for ya. There ya have it! 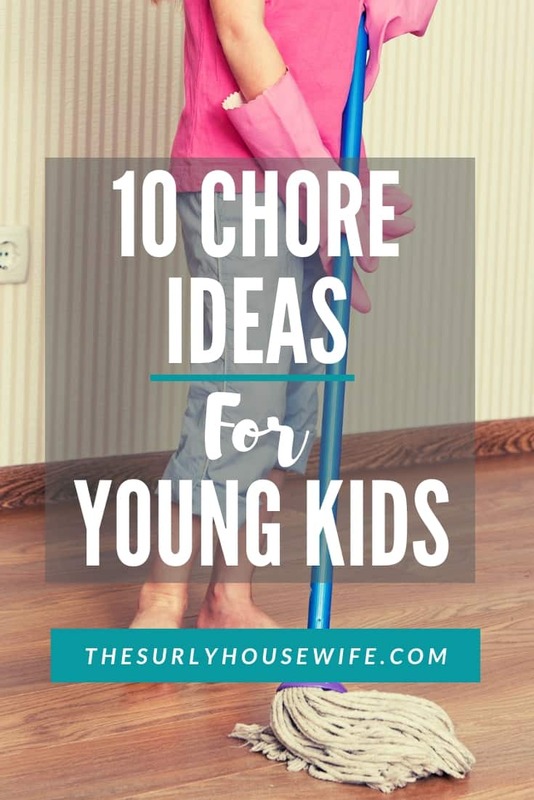 10 chore ideas for kids so they can start helping out around the house. Did I miss any? 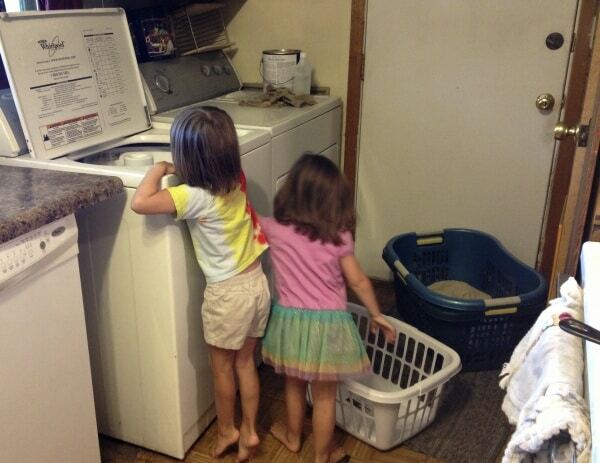 What age did you have your kids start chores? 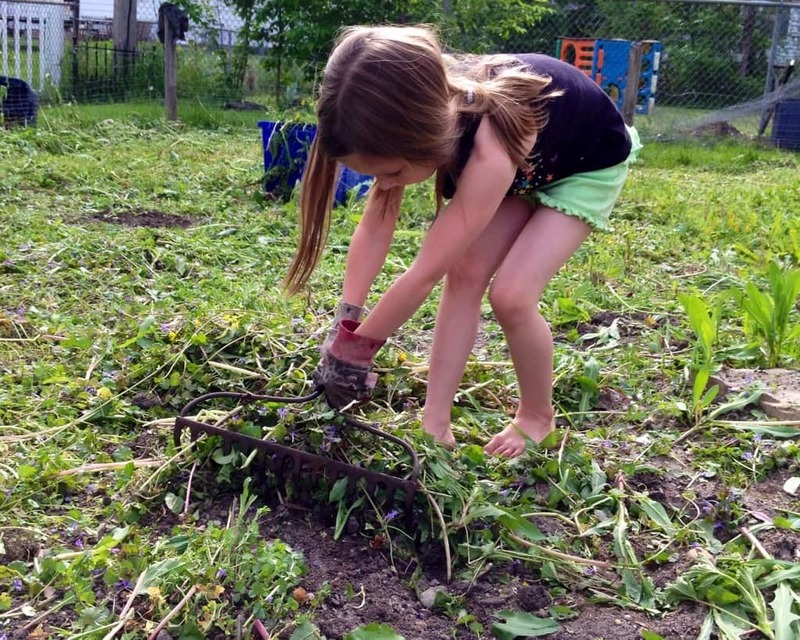 What chores do your kids do? 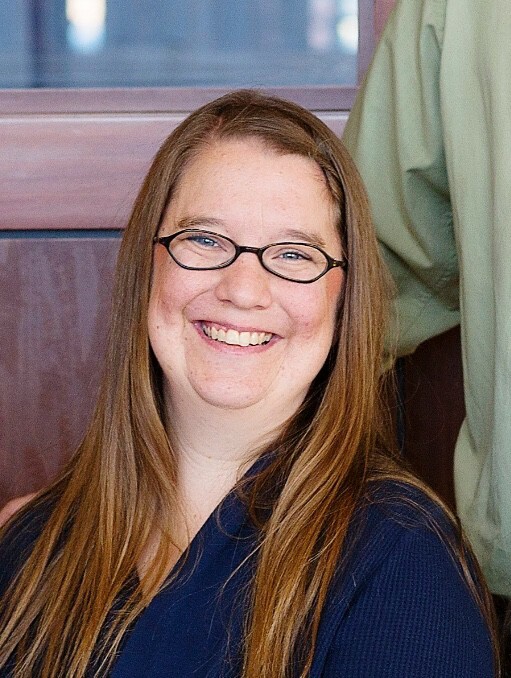 Great blog, Katie! I totally agree. My fellas who are now 10, 8, & 5 do many of the same things. I love the pictures of your girls hard at work! My fellas make their beds (most) mornings. 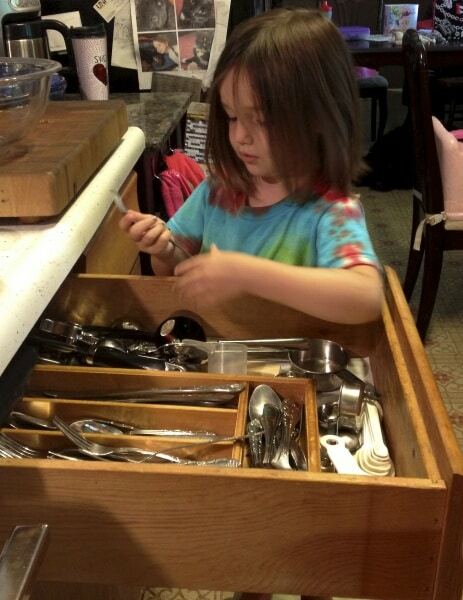 They 5-year-old puts away the silverware from the dishwasher. The 8-year-old puts away the rest of the clean dishes. The 10-year-old is responsible for clearing the dishes after every meal and putting then into the dishwasher. So far I still do glasses, pots, and pans, but I’m a little particular too. The bigger two also clean a bathroom each week. They contribute to its condition, so it’s reasonable that they handle the cleanup. Disclaimer: I do not have kids…. However, I do believe in giving kids chores that they can handle. We always had chores growing up. I also think that its great that you let your kids help you cook, I always wanted to help my mom cook growing up and now I love to cook. My sister never helped and she doesn’t cook, I always say she struggles at boiling water. I think its something that if you start out and early doing they learn to love or at least be able to feed their families. The girls LOVE to help cook. The only bad thing about it is our kitchen really isn’t set up for both of them to help. We do what we can though. Thanks for stopping by! Awesome!! 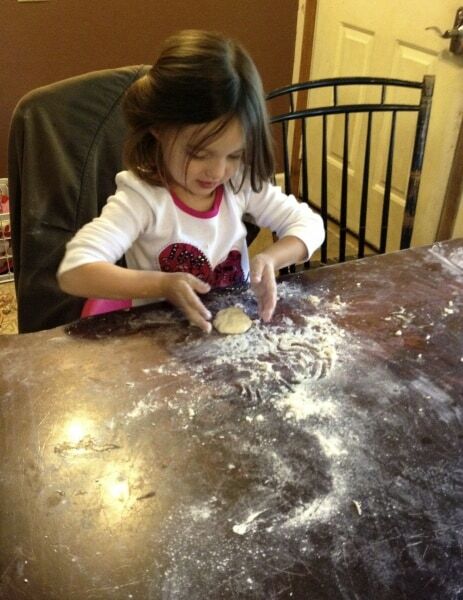 It’s funny how kids love to try new things, even if they are chores. What a great post. My toddler does all of those chores plus she helps with bathroom cleaning. Thanks! I think I need to have them help with more cleaning type chores, like wiping down counters etc. Thanks for the tip! I have a great picture of my daughter in a crown scrubbing the toilet. I made her take the princess dress off before doing it so it wouldn’t get splashed with cleaner. It is funny how they like to dress up to do chores. Thank you for sharing at Sharing Saturday!! Such a wonderful list! I get my girls to help out with many of these. 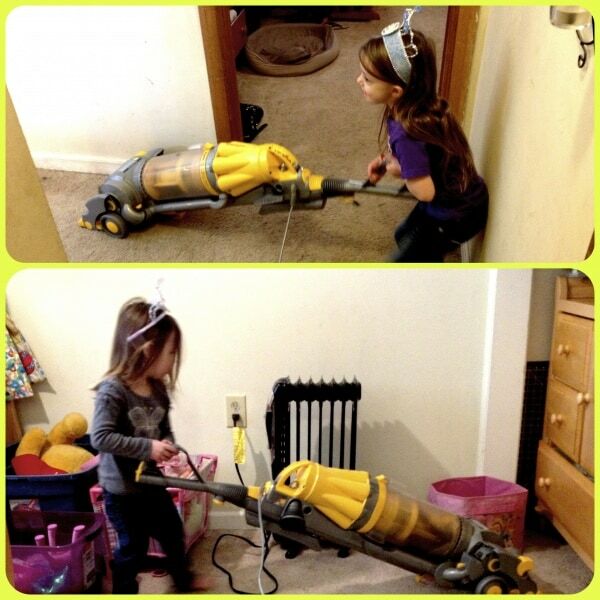 It’s so important to get children to help out around the house. Thanks for sharing (and for linking up to the SHINE Blog Hop). Thanks! For the longest time my oldest said she hated to do put away laundry. So I took over the chore, since she is feeding the dogs now. Found out tonight, she likes hanging up the clothes, not putting them in the dresser. It pays to be open to their opinions! The Surly Housewife is dedicated to helping homeschool moms go from doubtful and overwhelmed to confident and capable. Click on the picture above to learn more about me! The Surly Housewife is a participant in the Amazon Services LLC Associates Program, an affiliate advertising program designed to provide a means for sites to earn advertising fees by advertising and linking to Amazon.com.